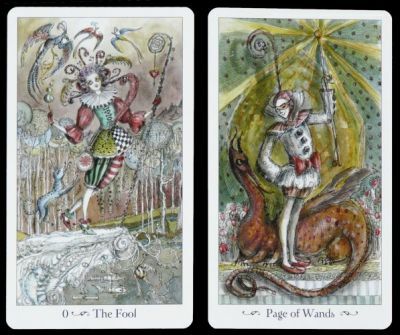 This tarot designed by Paulina Cassidy is freely inspired by the Rider-Waite tarot. The artist had lived a long time in New Orleans and got inspired by the carnival when she designed the cards. Adding Victorian costumes to doll-like characters makes this pack a very charming one. The printing process has not altered too much the ink and watercolour works. Some of the original ones are still for sale in her web site (www.paulina.ws). Cardmaker or editor: U.S. Games Systems (www.usgamesinc.com), printed in China. Price and where to find: This pack is available from the editor web site for US$ 18. Reference PAU78.